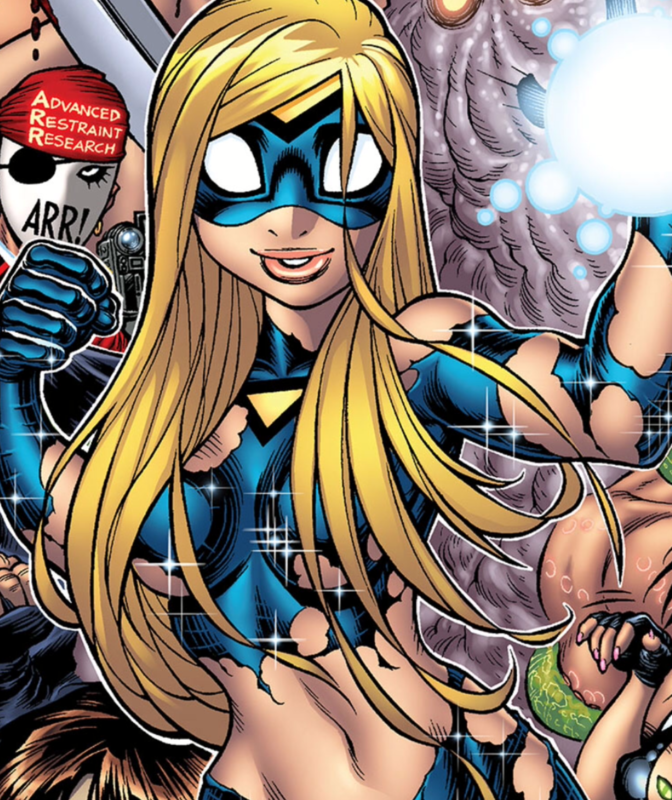 Comics writer/artist Adam Warren reveals much on the Empowered heroine, and much more in this fantastic exclusive interview! Comics writer/artist creative Adam Warren has entertained readers for over two decades with a signature style and wit. 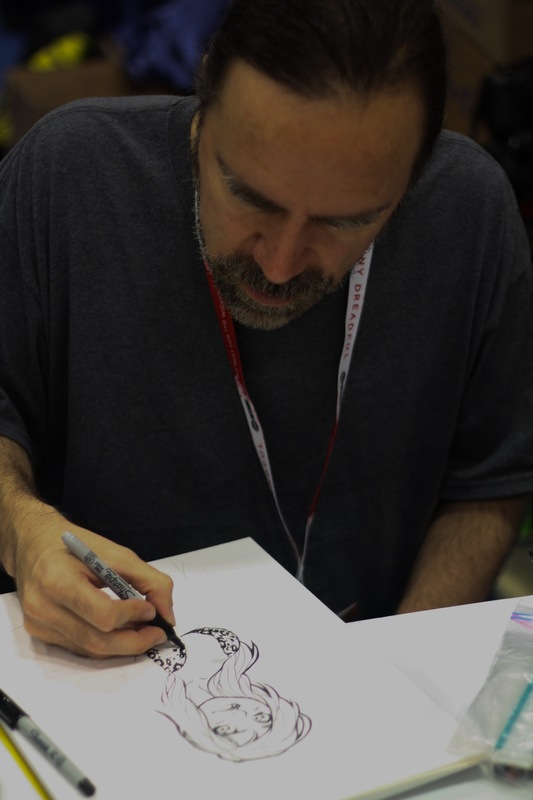 Older school fans may know him from his work with Dirty Pair (Eclipse, Dark Horse publishers), and Gen-13. 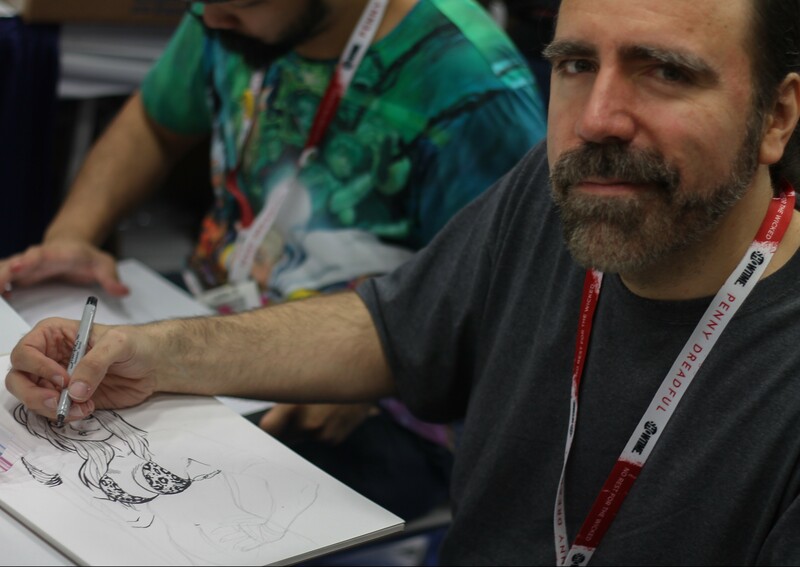 Since then, Warren produced his style through various comics, often with anime/manga influences combined with humorous tones, while poking fun on modern sexism in comics art. Currently through Dark Horse Publishing, Warren brings us the Empowered superheroine..
Warren’s Empowered series remains his most ambitious creative work to date, released in thick medium-sized trade paperback sized volumes. The pages within showcase the life of the self-conscious superheroine Empowered, whose powers come at the price of shrinking costume and repeat captivity. Empowered is full of action, humor, and fun. Warren: Off and on, I have done assorted Street Fighter based work for my friends at Udon. I actually wrote a little something for them in an upcoming project that I am not sure has been announced yet. But, it was a great deal of fun. I have always loved the Street Fighter universe, where I enjoy playing around. It’s always refreshing to do something for my friends at Udon. So, who is your favorite Street Fighter character? Warren: That would be Cammy! On to your current Empowered comic book series.. These books are a lot of fun and chock full of campy good times. Where does that energy and inspiration comes from? Warren: That’s a tough one. It’s a weirdly kind of based on life experiences and things that kind of happened to people I know, with conversations I have had in real life. It’s not obvious, because I never would never do autobiographical stuff in a million years. But, a lot of it is things that I have seen happen, that sort of inspired me to think how friends of mine would react to this kind of thing. Emp is partially based on several different women I have known, who kind of dealt with insecurities but overcome them with sheer force of will. It’s a kind of a combo of real life stuff and things I see or read about that, which would be kind of fun to address. The good thing about Empowered is that I can do whatever I want with it. I am not locked into a limited page count or I can take tangents and fun story variants without worrying how it fits into an overarching stream of continuity. Its openness and flexibility that lends itself to whatever I think is appropriate in a story. That kind answers my second question on Emp. On, if she was directly based on anyone you may know..
Warren: I wouldn’t say directly. When I was doing Magical Drama Queen Roxy, I interviews a couple of friends of mine and I would come up with their perceptions and break out with my own mold of thinking of what a younger female character would do, and Emp is sort of derived from a lot of that work and theories I had when working on Gen-13. In a way, she is sort of an unholy combination of Roxy and Caitlin from Gen-13; a sort of the good girl Caitlin girl crossed with the insecurities of Roxy. In an interesting sort of a way she is that combination of the two. Your Gen-13 work was awesome back in the day. I loved the hell out of that. Warren: Thank you very much. So. you may have you have heard about the recent controversy on that Spider-Woman cover of Marvel Comics with artist Milo Manara. I would love to hear your thoughts on that..
Warren: Definitely. It is a very different audience for us back in the day. I don’t know really..It’s one of those things I should like with the flexibility of Empowered to deal with some of the issues of objectification in its various forms. We can just leave it at that. Warren: Yeah, I usually stay the hell out of controversies when they grow online. But, I think that with Empowered, I heard we have a substantial female readership that seems to relate to the characters. I like to hope that I do the best I can to make Emp not nothing but an object. I see her as a human being. I don’t feel it’s that difficult to stay away and not go over the line. But your lines may vary. But, I do feel there is a bit of meta commentary on that subject with Empowered..
Warren: Yeah, I feel the meta commentary and a semi-deconstruction of varied weird super-heroine tropes that are out there..though we actually traffic in the tropes and say at the time that some people have issues with. But we had pretty good response and really pleased despite the off-putting elements that Empowered is pretty well received by a female readership. I’m happy about that and if I knew it was going to be a continuing series, there would have been aspects I would play down from the very beginning.. It actually evolved from a bunch of damsels in distress commissions during a time when my career was effectively dead. So, I got bored with that and it got turned into a real comic on what I was thinking on what goes through the mind and what someone has to put up with this crap that super-heroines have to deal with. It’s kind of where the whole series comes from. As it would relate to how someone in that position would think. The entire series derives from that, and it sort of took on a life of its own. I feel it’s kind of humanizing the sort of C-list superheroine…I like to hope. I think so. Now, I wondering what favorite female characters might have influenced your style on the female form. I have some guesses, and wondering if they match..
Warren: When I was a kid. I didn’t actually care for the comics but was a big Wonder Woman fan from the TV show more than anything else. But, DC Comics was rather boring in the 70s and Marvel was much more exciting. Warren: Oh yeah..And back in the day, Shanna the She Devil, of which I am actually drawing right now (see pic below). I was reading some of that back in the day. But, there wasn’t a ton of super-heroines coming out in Marvel. Warren: I wasn’t thinking anime or manga, until I was a grown-up. I didn’t grow up with any of that stuff. My first exposure to the Dirty Pair wasn’t until I was 18 or so. Clearly the thing with the heroines in manga and anime were much more important and influential to me than American comics ever were, since that point. Dirty Pair was your first work, right? Warren: Oh yeah. I was so taken with the characters that I thought they would make a great American comic, and I went lively off trying to develop that. I loved that work. So, with Empowered: Volume 9 coming out and to those dedicated fans out there, could you share a bit on what to expect in your latest installment? Warren: Yes! Volume 9 deals with the the fact due to that Emp is able to access a super alien arsenal. You don’t need to read volume 8 to follow it. But in that aftermath, she is now the literally the most dangerous human on the planet, because of her access to the super weapons. So, in volume 9, essentially all the major super villains in the Empowered universe are coming after her, and she is going to have to outfight and outwit and outthink and outstrategize pretty much all the major super-villains. So, it’s her alone against an endless sea of super-villains wanting to exploit her for access. It’s focusing on her more in than the last couple with Volumes 7 and 8 focused on Ninjette and Sister Spooky. Volume 9 is very much Emp-centric. So, a silly question for my curiosity. Let’s say somewhere out there a studio with millions of Disney dollars decides to produce a live action Emp movie that could work. Who would you picture as perfect to play Emp? And have you ever thought about this? Warren: I haven’t actually. I am trying to think..hmm, actually…that’s not entirely true. I think her name is Maika Monroe.. She was the star of It Follows, a recent indie horror flick. She would make a great Emp, actually. Ah! With Emp or otherwise, are there any other future projects from you in the works? Warren: After Empowered volume 9 comes out, I am working on a yet unannounced Empowered one shot entirely by me, and I am lining up some other Emp guest artists on some projects. And I am kind of nosing around some writing-only jobs, that I will hopefully pitch to Image. And, I got some stuff in the pipeline I can’t really talk about but with negotiating possible an interesting Empowered crossover..
Warren: But, I can’t really talk about. Hmm. 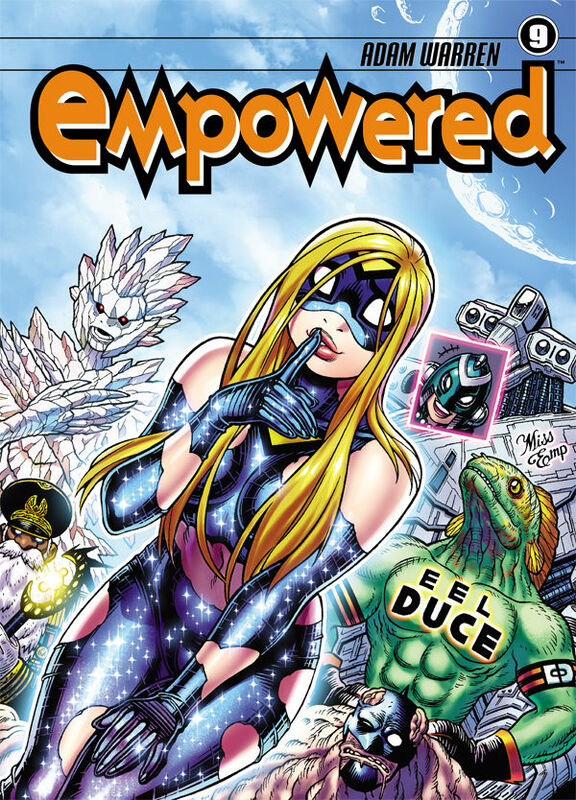 Well, for my final question.. do you have a message to fans, longtime, and potential new fans of Empowered? Warren: Thanks for every much for the support over the years, as my career has been extraordinarily rocky, but very pleasing too. We got to shows and run into people that were long time fans or new fans who support the work. I feel very honored, and really inspiring to me. I am very glad people appreciate the work..
And thank you, Adam Warren! Empowered: Volume #9, is out now on the shelves of better retail bookstores and comic stores everywhere, from Dark Horse Publishing. Earlier volumes are also available through retail book outlets stores, and via online apps that carry current Dark Horse titles.